The good news is now I can share my recipe entry with you all!! There’s nothing like a steamy bowl of Quaker oatmeal on a cold winter morning. This blend of wintertime flavors marries egg nog and nutmeg with a peppermint crunch in a nutritious and heart-healthy breakfast that will keep you warm and healthy from the inside out. Watching what you eat? In addition to the health benefits of Quaker oats, Silk Nog offers a light alternative to your favorite holiday egg nog with all the flavor and creaminess you crave. Crushed candy cane adds a festive crunch, heart-healthy walnuts lend a nutty chew, and a dusting of powdered sugar adds a subtle sweetness that’s light as snow. Combine oats, water and Silk Nog in a non-stick pot and set heat to medium. When oatmeal begins to thicken, begin to whip vigorously with a spatula, allowing the starch to be released. Continue whipping oats until reaching desired thickness, about 5 minutes. 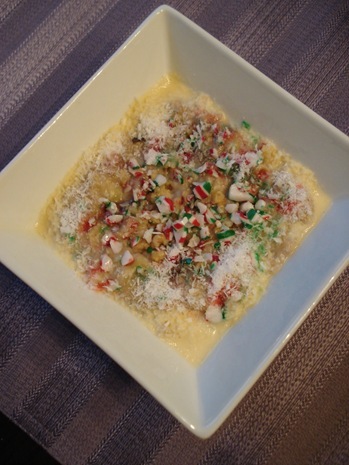 Pour oatmeal into bowl and top with crushed candy cane and walnuts. · Saturated fat is actually less than one gram but the program rounds up to 1. The small amount of saturated fat comes from oats and walnuts. · Added sugars are less than 12 grams, but total sugar is listed as 13 grams due to natural sugars in oats, plain soy milk, and walnuts. We were judged on taste, creativity and convenience. I knew I was taking a risk using Soy Nog, but I decided I had to go out on a limb to be original. I guess convenience had more weight than I had hoped. Nevertheless, the recipe turned out fantastic! I didn’t know how the candy cane would turn out, but the peppermint crunch is awesome (I recommend a candy cane over a peppermint because they are slightly sweeter and less minty). Since we were required to use a strict heart-healthy nutritional guideline, I couldn’t use coconut for snow because of its saturated fat and had to keep the portions of toppings teeny-tiny, but it was still excellent. And you bet I ate all of the 3/4 a cup serving! So today, I re-made the recipe without restrictions: KERF Style! I would have used Soy Nog again but all we had on hand was the real deal. I decided also that I liked it drizzled on top more than cooked inside. I made it with half a cup of oats today since I didn’t add any more grains. Prepare whipped banana oatmeal base as directed here: Kath’s Tribute To Oats. Top with toppings. Crunch away! Our milk smelled funky this morning so I dumped the last of it down the sink, which left only soy milk for my coffee. Despite tempering it in the microwave and adding “acid to milk not milk to acid” it still curdled 🙁 I had to stir it to try to partially emulsify it each time I took a sip. I am stopping in for milk on my way home! I heard y’all loud and clear on the “More…”. No more more! 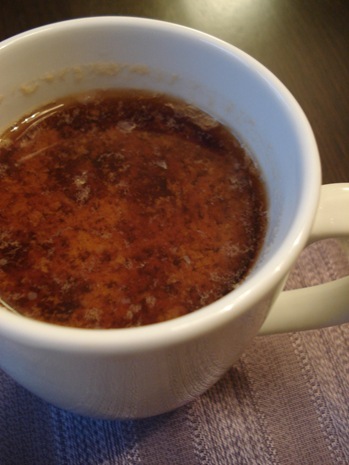 The trick to adding soy milk to coffee is… let the coffee cool slightly before adding the soy milk. I let mine sit for about 3 minutes and I promise, no gross curdling! UM, your recipe is WAY more original and WAY yummier!! I’m sorry you didn’t win; this sounds like a winner!! I LOVE Silk Nog but have never made it with my oatmeal. Perhaps this week I’ll swirl some in! Mine never curdles… although, I add it to tea and not coffee but that shouldn’t make a difference because it’s still boiling water you are putting it in. On the milk container it says not to add it straight away and only after your tea/coffee has cooled a bit, which is what I do (and what Claire said she does as well). good luck at the dentist! i hate how my teeth hurt after even just a plain old cleaning. the oats loog awesome. very festive! I can’t get egg nog in carton in my part of the world. any thoguhts on how to make it youself in a somewhat healthy way? SO festive! I love the sprinkling of powdered sugar snow! aww i liked your recipe!! Your oats were so pretty. Love the holiday colors! Would be a great b’fast to serve my family on Christmas morning. Your oatmeal entry was so cute and festive!! You totally should have won in my book! I’m glad in todays oats you could go all out with no restrictions too! Have a Merry Christmas! I like yours more Kath!!! but when I add soy milk in Co-op, it doesn’t look like that. Why is that? The oats are so pretty and festive! I thought your oatmeal recipe was more original, I would have voted for yours! Do you know how you did on finals yet?? I miraculously got a B in Organic Chem! Isn’t it great not having to go to classes anymore?! What a great festive bowl you got there! What’s the deal with soy, what a bother?! I usually have better luck when I add the coffee to my soy, the whole acid to milk thing, strange?! how temperamental! Thats a beautiful bowl of oats! Candy cane? Wow I would not have thought of that! yum! what a great breakfast. i love soy nog! Just when I thought you’d made every oatmeal recipe under the sun………a brand new one! :) Thanks for sharing. How did you create the nutritional profile? I love it Kath! It looks great!! SO pretty and festive! I’ve never had that problem with soymilk! When I worked at Starbucks, my drink of choice was black coffee with about an inch of cold soy in it, and it never curdled……strange. I love your recipe! It’s so pretty. If only I had some eggnog, I’d try it this morning. You’re right, convenience must have been the deciding factor in the contest. I am bad and am hooked on hazelnut creamer. Oh, and Blueberry tea from Celestial Seasonings, tastes almost like a tart juice rather than tea. Creative recipe, but it does look like convenience was much more of a factor. 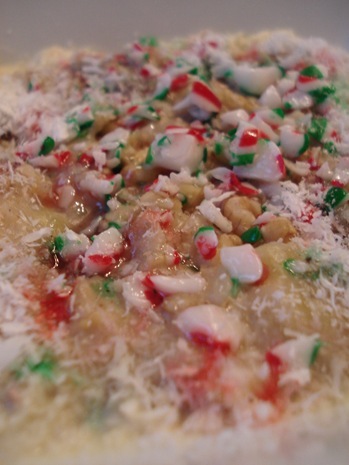 Those oats look disgusting….then again I hate egg nog…and nutmeg.. But the candy cane… :/ meh. Anyway, my tip for adding soy to coffee is to 1st, heat up the soy a little bit and also let the coffee cool a bit on its own before adding. When I get coffee at a coffee shop I always ask them to steam a little soy milk for me, since adding the cold soy will curdle and be gross. Your oats are festive!! 🙂 i love it. I have to agree…i cool the coffee first and never get weird clumps. I also use the vanilla soymilk and it’s like a flavored creamer to boot! what a festive breakfast! Hah Hah. Would look cute next to a gingerbread house. I love soymilk. I make a nice smoothie using light silk chocolate soymilk, banana, and almond butter. I could see Quaker not loving the sugary candy cane and powdered sugar in a healthy breakfast, but i think i’d choose that over 3 teaspoons of splenda. that amount seems waaaayy too sweet! Wow, really? I mean, sure, coffee & oatmeal together is interesting and all, but it’s such a boring recipe!! Hardly an interesting ingredient at all!! I would have gladly taken the 3 extra minutes to do yours and having something fabulous. I think everyone here agrees that you should have won!! Interesting about the soy milk. That curdling has only happened a couple of times to me. The first time, I made the coffee shop give me a new cup of coffee thinking that they gave me old milk…they must have thought so too because they did it w/out question. Whoops! With all due respect to PastaQueen, you recipe looks sooooo much better! The colors, textures, etc… sound amazing. In my book you won! Love the oats they look delish! Your recipe sounds amazing and so festive. I’m sure PastaQueen’s recipe is good, but yours looks and sounds even better! I mean candy canes and egg nog? Can’t go wrong! I bet your recipe is as delicious as it looks! And your Christmas cardio class sounded like a blast. Thanks for getting rid of the “more”! omg this looks ridiculously amazing and im trying this ASAP!!!! I love egg nog so much! It is one of my favorite parts of the holiday season. 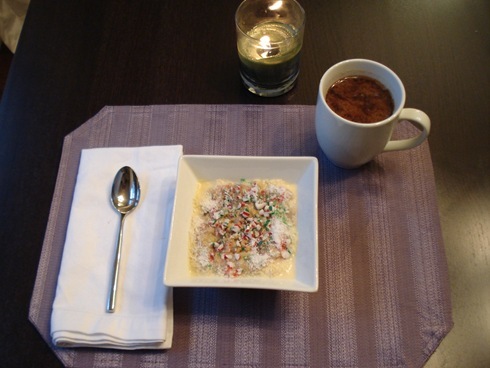 Your seasonal oatmeal looks delicious! GREAT title Kath – I’d say your best ever, and you’ve had some really good ones! I love your entry for the Quaker contest. I was wondering about that Silk Nog just the other day – I think I will pick up a carton now just to see what it’s like! 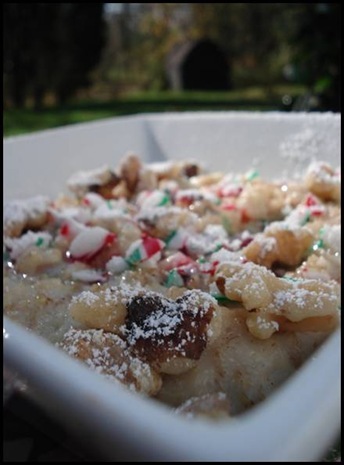 And it’s so creative to put candy cane in the oats – I may have to make this combo on Christmas morning! So creative with the oatmeal!! It’s so pretty too! You totally should have won! And wow! 5 am spin! I’m impressed! yum yum YUM. that was a great entry, Kath. I am sorry you didn’t win! Congrats on the recipe…looks and sounds spectacular! If only my husband could handle the smell of peppermint! *”congrats on being able to share the recipe”… is what I meant to type the first time! why did people care about the “more”? is it too much work to click a word? this looks like the perfect way to get your kids to eat oats. Thanks for all the nice words about my recipe guys. Let’s be good sports though! I haven’t ever tried to make it myself, but I’m sure there are ways. Not sure on a light version though. Congrats on being done with exams!!!!!!!!!!!! I don’t know how I did this semester yet because Winthrop disables all transcripts until ALL grades are posted – which isn’t until the day before Christmas!! So even though some of my profs posted grades last week, I can’t see them 😡 Guess it’s either going to be a wonderful or horrific Christmas present 🙂 Congrats on your B!!!!! So glad that class is behind me. I did it on Nutrition Data.com. Their database was pretty limited so I had to enter in a few of the ingredients by hand. You may not have won but you’re recipe sounds like a winner to me 🙂 That was really cheesy but it’s true!! Expresso oats, nothing new — I’ve made them many times before!! Haha, though that is a good pick for Quaker based on convenience and marketing. Well, I still want to try yours — it looks yummy to me! Ooh, did someone mention egg nog coffee? YES! That’s how I get my egg nog fix this time of year. I put 1/3 cup of eggnog (the real deal, either full-fat or low-fat) into 1 cup of coffee and enjoy every sip of it. It’s how I get through December, the darkest month of the year! Egg nog oats sound really, really good! I’d have to taste the mint+egg nog combo to be convinced if I like those flavors together, but cheers to you, Kath, for your creativity. I like a person who isn’t afraid to take a chance on something new. Genius! Haha I kinda guessed it last night with my comment 😀 I will definitely try this. Great job. Ohh this is a good combo! I thought it was my idea though. I actually tried it my self, this morning, before reading your blog! Love silk nog! The extras look tasty. YUMMM. These oats look fantastic, Kath. EGGNOG! What a great idea!! I am totally going to try this out. You have 56° and Easter, and we are battening down the hatches, awaiting a winter storm…ah well, perfect time to begin my holiday baking! Take care. 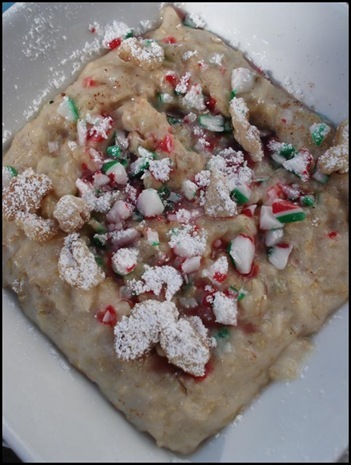 I love your candy cane oatmeal recipe. Looks amazingly festive. You are very creative. Great job! I love the little nutrition label. 😀 I kinda like the addition of the soy nog. Kath, Sorry, I get that this is your blog and all, and I love reading it, but I’m just giving you my opinion. Some times I like your recipes, sometimes I don’t. It seems like everyone just blindly agrees with you, no matter what. So, you only want comments that agree with you? or you want people who might be honest. I gave you tips on adding soy to hot coffee as well as my opinion on your oats..sorry its breakfast…the idea of candy in my oats is kinda nauseating. All you have to say is: “I’m not sure that would sit well with me” or something polite. I have absolutely no problem with dissenting comments as long as they are nicely spoken…er..typed. yay for no more “more!” thanks! That’s just how I am, I can come off harsh, but I don’t necessarily mean it to be mean necessarily. It just comes out that way, especially on the internet. Sorry, I’d sooner say, “wow that makes me want to vomit” than “I’m not so sure that’d sit so well with me.” Again, love the blog, but as long as you accept comments, I’m going to word things how I word things. And not pander. 🙂 Have a good night! Can’t wait to see whats for breakfast. Woo! What a great idea! I can’t wait to try that bowl of oatmeal! 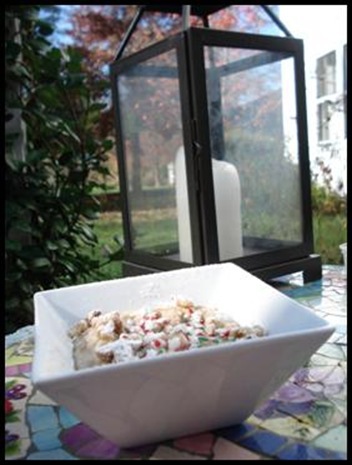 I topped my cranberry/pistachio oats this morning with crushed candy canes – Fantastic! As always, thanks for the great idea, Kath!!!! Oh, my gosh. That looks DIVINE. Thanks, Kath! Your recipe sounds yummy too. Now I have a somewhat healthy way to eat candy canes. Holy creative! This is great. You were robbed. I totally would have voted your Egg Nog Oatmeal. What a fantastic idea. Since it’s Spring and not much in the way of rummy nog in the store, now I want to experiment with Rum Raisin Oatmeal. Oh wait, I don’t have to…you do it! I’ll check back! Rum (or extract), Raisins, Walnuts, brown sugar. Oh yes, that would be holiday-like, too.